These are another prop from our recent production of Cabaret. As I've mentioned before, it was my job to create a smorgasbord of (inedible) German treats for the engagement party scene. I had recently seen some beautiful prop rolls created out of latex coated upholstery foam, and so I wanted to give the technique a try. I did some poking around to find photos of German foods, and I found a photo of some beautiful rolls over on familyoven.com Now, this might be a good time for a disclaimer. 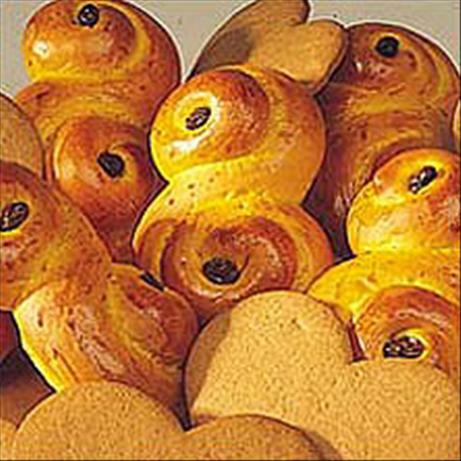 I cheated a bit, St. Lucia buns are actually Swedish. Swedish, actually. Don't tell my boss. Making these buns is very straightforward. First, use an Olfa knife (or other utility blade) to carve upholstery foam into the appropriate shape. After carving the rolls, give them a few coats of liquid latex. Once dry, use some thinned acrylic paint to give them some color. I mixed my paint with matte medium. Finally, stuff the little divots in the buns. I used a combination of sawdust, flex glue, and acrylic paint. Once they are dried, put them in a lovely basket, and put them onstage! The only thing that I don't like about this technique is that it is very difficult to get the rolls to be nice and smooth. Perhaps I just need more practice, or perhaps I'm missing something. Does anyone have a surefire way to get upholstery foam to carve smoothly? If so, please comment below, I'd be happy to hear it! I stumbled upon your blog when I was assigned to make a fake pizza for a cabaret and found your tips on salt dough to be a lifesaver! On a whim, I decided to try out some of your projects and I'm currently making danishes out of upholstery foam. I'm really excited to see how they come out! Your blog is really inspiring and I hope to see more in the future. Loved this food,going to try this in home. Your foods are great! I love using a electric carver to cut upholstery foam. Like the ones to carve turkeys, makes super smooth cuts! Did you know that you can shorten your urls with Shortest and make dollars for every visit to your shortened links.